Brian, his wife, and their three children are residents of Longmont, Colorado – a small and formerly-ag community outside of Boulder. His work history is primarily made up of working in small or entrepreneurial organizations in various roles. Prior to joining the Boulder County Farmers’ Markets, he managed teams of five to 30 for technology innovation companies including CEO of a provider of telecommunications program management and engineering solutions and Vice President of an air-filtration technology company with national distribution. Brian’s time in business allowed him to gain 20 years in business leadership, business operations, business development and product development experience. Brian came to the Boulder County Farmers Market weary of the mission of profit-and-me-first. He wholeheartedly applied his previous experience to the nonprofit mission of promoting local growers and supporting the connections with their community. 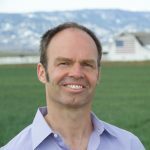 The combination of Brian’s business experience and passion for the importance of reconnecting communities with their farmers and ranchers has led to growth in their existing markets, the successful launch of their fourth market, increases in farm sales, new collaborations, and accolades including earning the title of ColoradoBiz CEO of the Year for 2015 (first nonprofit selection in history of magazine), Boulder Business of the Year, and the pleasure of being a TEDx Boulder speaker advocating for connection to local food. Best of all, his kids eat a copious amount of fresh fruits and vegetables and love it.